This River Shall Burn is Metal Mike's entry into the dark world of poetry. Expect to find great abstract images and haunting rhyme. This book was found inspirational to a few poets of today and we think you also might find it quiete interesting. Check it out. Ready To Improve Your Guitar Chops? 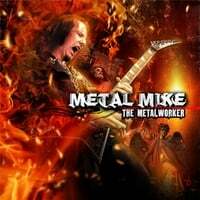 Mike's Latest Solo Album "The Metalworker"
© 2019 Welcome To The World Of Metal Mike . All Rights Reserved.